Two sprint powerhouses from the Southern Section cemented the 2018 California State Championship titles on the final relay of the evening. Although finishing 3rd in the strongest league in the state, Murrieta Mesa overcame the odds to claim their first state title. Meanwhile, in identical fashion, the girls from Gardena Serra also used the 4x400 relay to lay claim to their school's third state title and first since 2012. 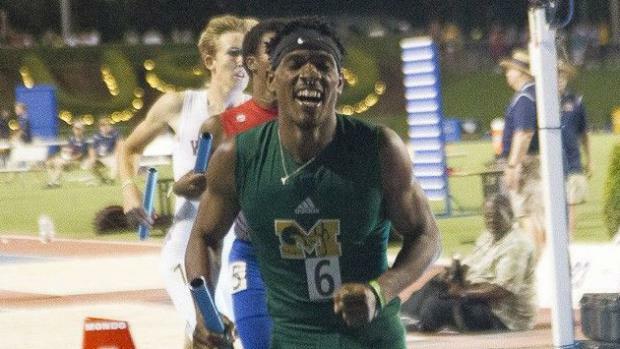 As Christian Shakir-Ricks crossed the finish line for his Murrieta Mesa Rams with a 45.6 anchor, the fireworks began booming in the background in celebration of the conclusion of the 100th edition of the California State Track & Field Championships. One of the rare states that contests one division for its state meet, when one wins the state title, they are truly that one and only, state champion! The boys' most valuable athlete of the meet, Shakir-Ricks crossed the line in 3:10.86 in a new national leading mark and #3 time ever in Riverside County history. It was also the fastest recorded at the state meet in five years. The Rams were in a hole early on after their 5th place finish, six points behind league rival, Great Oak. But, Shakir-Ricks came back with a 3rd place finish in the 100 meters (10.53) and stayed true to form in capturing the state title in the 200 meters (20.98) for 16 valuable points. In between both of his efforts, Matthew Okonkwo earned a 4th place finish in the 400 meters for five additional points. Okonkwo had not gone under 51 seconds coming into the season and improved by almost four seconds. Once Great Oak, slight favorites coming into the action, was shut out in the discus (where we projected 6-7 points), the door opened up for Mesa to claim the title. Needing a 4th place finish to share the title, and a 3rd place finish to clinch it, Mesa went to another level on that final relay. We predicted in our pre-meet prognostications, that if the title was on the line, Mesa would win it, but truthfully, did not anticipate a sub-3:11 performance! The team title stayed in Riverside County for the 4th consecutive year, with Vista Murrieta earning it in 2015-2016 and Rancho Verde claiming the prize in 2017. Despite Great Oak capturing the 4x100 relay, along with CJ Stevenson's defense of his triple jump title and 14 points overall, Murrieta Mesa finished with 35 points to Great Oak's 30. Meanwhile, Clayton Valley finished with 28 points, despite a season ending injury to one of the best hurdlers in the state. 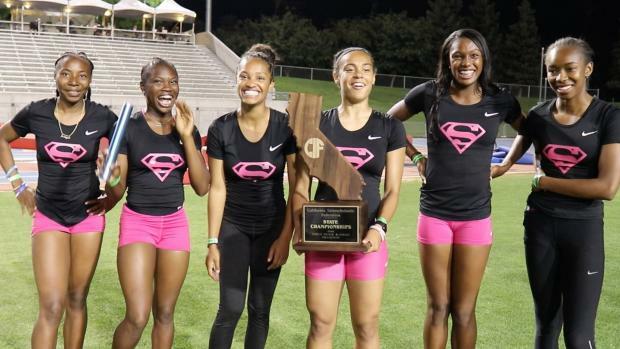 The girls of Serra earned points in the exact same fashion as Murrieta Mesa. Knowing the title would be earned in the trenches of the 4x100 relay along with 100 and 200 meters, most of the load was on junior Jazmyne Frost. 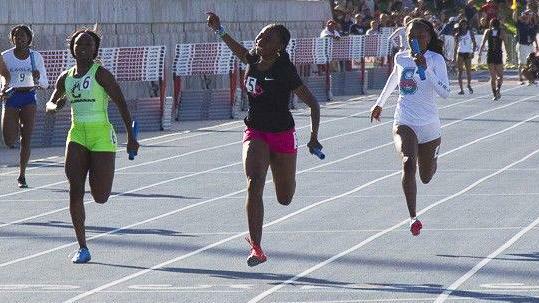 She did not disappoint in earning 14 points in both short sprints (2nd in the 100 and 3rd for the 200). Kicking off the evening, Serra's girls defended their state title in the 4x100 relay with the fastest time in California this season in 45.69. This elevated them to #5 in the United States. Like their male counterparts, they summoned some additional points in the 400 meters. Improving by over two seconds in this postseason run, Jaylah Herron joined Serra this past offseason for moments like this. Her 54.80 (55.79 was her previous best coming into the meet), yielded a 5th place finish and four valuable points and would prove to be a huge factor when the points were all tallied. Looking to hold off the fellow sprint powerhouses of Calabasas and Long Beach Poly, Serra had to regroup upon watching the conclusion of the 3200 meters. That is when the Oak Ridge twins, Elena Denner and Maddy Denner, crossed the line together to earn 18 astonishing points to catapult their school into the lead at 33 points. With Maddy defending her state 1600m title earlier, the two earned 15 points in the four-lap race. Rather than clinching the state title with a 6th place finish, Serra now needed a 3rd place finish. The quartet of Herron, Maya Rush, Queen Okoh and Frost did more than that. Earning 18.5 points and the girls' most valuable athlete, Frost anchored her crew to a 2nd place finish in a new seasonal best time of 3:44.37 to earn the team championship. Serra finished with 36 points, to Oak Ridge's 33. Calabasas was 3rd with 30 points.